Climbing St. Lucia Gros Piton mountain is an amazing experience. This majestic peak is sister to Petit Piton, one which is recommended to all and fully supported by the St. Lucian government, Gros Piton shoots 2,619 feet from the sapphire blue waters of the Caribbean Sea. Our Gros Piton mountain is nestled between two historic beauties of St. Lucia; the town of Soufriere, then the old capital of St. Lucia during the French ruling and Fond Gens Libre (Valley of the free people). 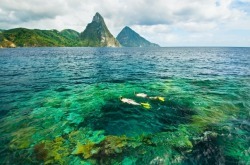 St. Lucia Gros Piton mountain a major tourist attraction and natural landmark, for many years. In fact it's rocky slopes, Eco-settings (dry coastal forest to elfin woodland or cloud forest), and spectacular views of Petit Piton, neighboring islands, and more pristine landscapes of St. Lucia makes this cone-shaped mountain makes the ideal volcanic monument for adventure seekers and rock climbers and families interested in hiking.The vintage community of Fond Gens Libre sits bravely at the foot of Gros Piton, guarding it for many centuries now. Fond Gens Libres settlement dates back to the 1700's, and during the slave rebellion of 1748, Brigands, or black freedom fighters, used the Gros Piton area as a secure oasis, and many descendants still live in the community, serving as hiking guides. Driving on the dirt road that leads to the rural community of Fond Gens Libre, you will treasure how inaccessible the area must have been, and still is to this day. Approaching this historical community, you will feel the rustic aura of St. Lucias country life, passing through magnificent stands of cocoa, banana, coconut, mangoes, and many other exotic produce of this Caribbean island. Maneuvering your vehicle around a myriad of bumps and potholes are as much part of the rustic adventure, and fording two streams, before reaching the sign that marks your arrival. Fond Gens Libre is only one of the gateways to Gros Piton Nature Trail, the other entry way is through the secluded Anse L'Ivrogne Bay which is nationally renowned for the "Blue Hole". Guided Gros Piton tour to the summit of Gros takes approximately 2 to 3 hours one way. Along with a Real St. Lucia Tours guide, the interpretative center at Fond Gens Libre provides a KNOWLEDGEABLE guide which is mandatory to proceed on this nature trail for safety purposes and to keep hikers informed. The hike starts out relatively easy, gradually climbing higher up but constantly surrounded by fresh Caribbean breeze, tropical vegetation and amazing views. Several benches along the path also provide a place for rest and relaxation. Be sure to stop at both lookout points at the top, as guides normally stop at the main lookout but skip the secondary lookout, allowing a spectacular view of Petit Piton. The Gros Piton Mountain Nature Trail is alive with natural, cultural and historical charm. There are several caves and 'look out points' dating back to the days of the Brigands. The arduous yet exciting life of the Brigands is brought to life with the aid of tales and legends recounted by the guides. The trail weaves through three different ecosystems boasting an Eden of flora and fauna, some endemic to the great mountain. The entire hike is serenaded by a melodious orchestra of a multitude of exotic birds. One may even catch a fleeting glimpse of the elusive mongoose. Upon arrival at the summit there are two viewing points. The panoramas to the north and south of the island are quite simply beyond verbal description. Just as Islelander St. Lucia, most experienced hikers of Gros Piton recommends the cooler part of the morning as the best time to commence trekking to the summit of this rocky, sloped mountain.